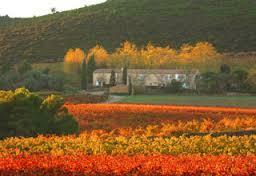 The first vineyards at Domaine de Fontsainte, in the Corbières appellation, were planted by the Romans. Artifacts found in these vineyards, such as an old coin dating from the time of Marcus Agrippa in 25 A.D., are a testament to its antiquity. The original domaine was built around a thermal spring, which was later named for the local, twelfth-century patron saint, Saint Siméon; hence Fontsainte--the saint's fount. Yves Laboucarié's family has been making wine here since the seventeenth century, and we were lucky to have met him so early on in his career. For over thirty years, KLWM has been proudly importing his wine, and now we work with his son, Bruno. Like his father, one of the first vignerons working with whole cluster fermentation in the region, he believes strongly in the family's legacy of innovation. He has re-equipped the cellars, replanted new vines, and even added new cuvées. Here at KLWM, we make no secret of why we have been working with them since 1978. In their lovely part of France, year in and year out, they are the best. The fairness of their pricing allows us to offer incredible values to our clientele. A crystalline salmon color with superb amethyst tints. Fine separate legs run slowly down the glass. Expressive and particularly tonic, the wine immediately gives off notes of raspberry, cherry and freshly picked strawberries - followed by exotic aromas such as pineapple and mango.